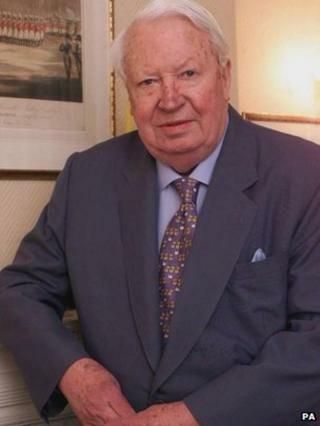 The police watchdog is to investigate whether officers failed to pursue allegations of child abuse made against former Prime Minister Sir Edward Heath. A retired detective has alleged that claims were made in the 1990s but not followed up. The Independent Police Complaints Commission will also look at whether a case was dropped when a person involved made the claims against Sir Edward. The inquiry was opened after claims made by a retired senior officer were referred to the IPCC by Wiltshire Police. Sir Edward died at his home in Salisbury in 2005 aged 89. An IPCC spokesman said: "It is alleged that a criminal prosecution was not pursued when a person threatened to expose that Sir Edward Heath may have been involved in offences concerning children. "In addition to this allegation, the IPCC will examine whether Wiltshire Police subsequently took any steps to investigate these claims." Media captionSupt Sean Memory: "I would actively encourage people to come forward"
In a statement, Wiltshire Police said: "Sir Edward Heath has been named in relation to offences concerning children. "He lived in Salisbury for many years and we would like to hear from anyone who has any relevant information that may assist us in our inquiries or anyone who believes they may have been a victim. "Some people may never have spoken out about the abuse they have suffered but we would urge them to please contact us and to not suffer in silence." The Sir Edward Heath Charitable Foundation, which operates the museum at Arundells, his home in Salisbury, said it welcomed the investigation. "We wholeheartedly believe (it) will clear Sir Edward's name and we will co-operate fully with the police in their enquiries," a spokesman said. Sir Edward led the 1970-1974 Conservative government and took Britain into what was then the European Economic Community. His time in power was beset by industrial action and economic difficulties that forced him to introduce a three-day week. He lost his leadership of the party to Margaret Thatcher in 1975 - something he never forgave her for and he did not serve in her cabinet. In his later years he became the Father of the House of Commons, the longest-serving MP. He was a successful author, an avid art-collector and a world-class yachtsman.